EQUUSOMA™ incorporates Somatic Experiencing® as a foundational lens through which to work with human clients in equine-facilitated interventions, to guide equine-based activities and facilitator interactions so that they do not inadvertently overwhelm or re-traumatize clients, and also to recognize what is happening in the nervous system of the equine partners in order to ensure their needs are recognized and attended to in the process. The safety, consent and empowerment of all participants are a priority. Developed by Dr. Peter Levine, Somatic Experiencing® is a trauma resolution method that is grounded in an understanding of how mammals respond to and recover from stress and life threatening situations (shock trauma). Originally created as an approach to healing trauma in humans, the science underlying the method has broader applicability to understanding equines as well. Somatic Experiencing® provides a gentle way to work with sensations, arousal in the nervous system, and thwarted survival responses (procedural or implicit body memory associated with fight, flight and freeze and associated survival activation) by building capacity to bear witness to what is happening inside in small, incremental amounts (titration). This process isn’t just about sensations, but also allows us to work with the over- and under-coupled emotions, thoughts, beliefs, images, sensory details, behaviours (including impulses, movements, and actions), and dynamics that are associated with different life experiences and stressors. Building slowly, we can support the ability to experience progressively larger thresholds of activation and embodiment in order to both respect and grow the window of tolerance. As we grow our resiliency and capacity to be with our internal experience, the need for defensive or management strategies decreases (such as shame, dissociation, fragmentation/switching ego states, avoidance, resistance, intellectualization, pleasing, complying, addictions, disordered eating, overriding through willpower, and so on). The ultimate goal for trauma recovery is that of renegotiation – completing what did not have a chance to complete, safely releasing and processing what is stored in the organism, restoring the natural ability of the system to regulate, and experiencing a felt sense of aliveness or triumph. Allowing time for the nervous system to integrate each small shift is important, so that a different felt sense of oneself in the moment can emerge. Most trauma-focused approaches will focus on the impact of trauma on the brain and nervous system. This is important knowledge that informs our understanding of traumatic symptoms and ways to intervene. However, there is more to trauma than just the brain – the whole organism gets mobilized and activated in the face of threat, and there is more information being sent from our organs and other systems up to the brain than the brain down to the rest of the organism. As a result, an approach that understands the greater picture of survival physiology and how to support the organism towards not only self-regulation but also greater organization and coherence is crucial in order to develop resilience. The ability to regulate and accurately sort for safety, danger and life threat occurs as a result of attuned attachment relationships early in development. When the buffer provided by regulated caregivers is not present to help us navigate life’s hurts and losses, emotional and physical dysregulation ensue and relationships become scary, unpredictable, unreliable, and unsafe. Since fighting and fleeing are not possible for human infants, survival energy in the body consists either of high sympathetic charge or shutdown, like an on and off switch. Repairing attachment and boundary ruptures helps increase our capacity for connection and closeness as herd mammals and supports the release and metabolization of high survival states. This involves working with the components of attachment in mammals: safe haven, secure base, proximity seeking and separation distress. 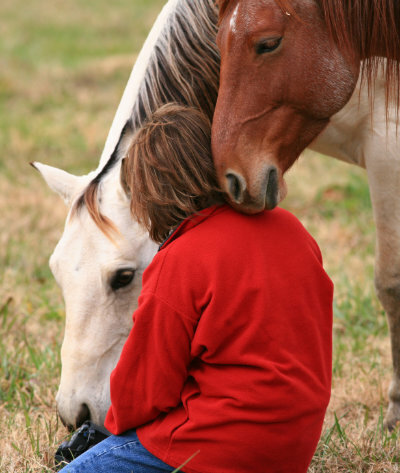 Experiencing co-regulation in the presence of attuned human facilitators and the much larger resonant field offered by equine nervous systems supports corrective emotional experiences, a restoration of a sense of belonging in community, and sets the foundation for self-regulation. Like equines, humans have a life history, nervous system, and a personality that intersect in complex ways. One of the hallmarks of trauma is that it overwhelms a person’s capacity to cope. Fragmentation in one’s sense of self is not uncommon, resulting in a sometimes confusing inner landscape where different or even conflicting parts or ego states have different roles to play in support of our survival and protection. Experiencing different ego states and mixed emotions does not necessarily mean that one has dissociative identity disorder, though this may be the case for some individuals. Fragmentation occurs on a continuum, from small-d to large-D dissociation and anywhere in between. 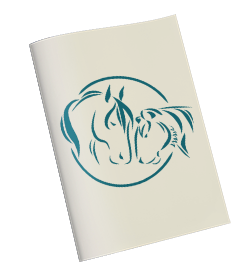 Exploring the reintegration of all parts of self into a cohesive whole, by befriending them and holding compassion for how splitting off each of these aspects of ourselves benefitted our entire system, is an important part of trauma recovery that can be facilitated through exploration with the roles of various equine members in a herd.